Bicolor Ha/OIII image. 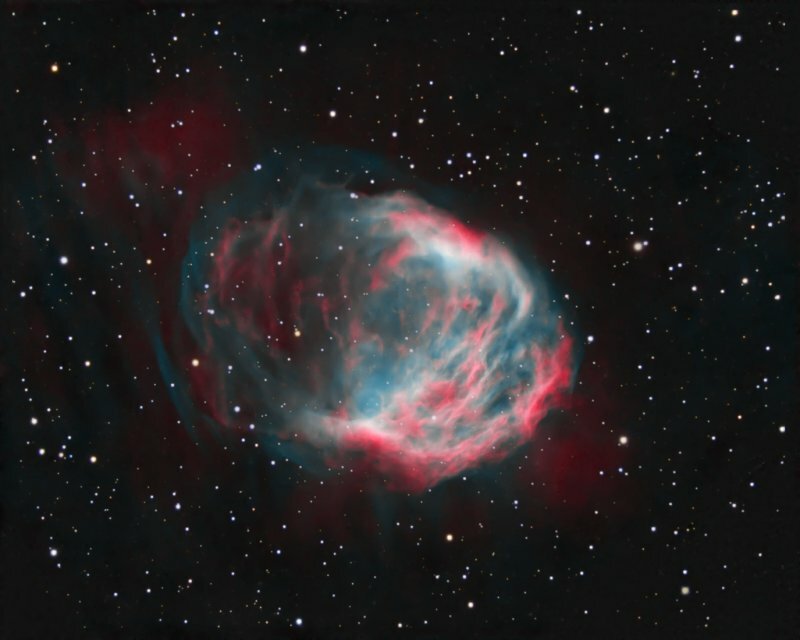 Ha mapped to red, OIII to green and blue, using a 50/50 Ha/OIII blend as luminance and RGB for stars. Exposure: Total exposure time about 36 hours, 45 x 20mins Ha, 58 x 20 mins OIII, 13/15/15 x 2 mins RGB. All bin 1x1. Captured over 17 nights in January and February 2017 and January to March 2018. Mure Denoise on OIII and RGB. It seemed too aggressive on Ha (which is unusual - maybe because of the registration errors? Merged narrowband channels in PixelMath: mapped Ha to R, OIII to green, 85% OIII and 15% Ha to blue, and used 50/50 Ha/OIII as luminance in LRGB Combo. Shifted green to blue using mild SCNR. A lot of work but man, what a beauty! !